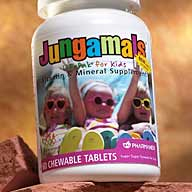 Jungamals are the lifepak vitamins for children 2 and up. Parents know that making sure a child's diet contains the proper nutrients is not an easy task. But it is an important one because children need the right nutrients to grow and develop. Jungamals helps balance children's diets with the nutrients that are important for healthy, growing bodies. Plus, Jungamals tablets are chewable and flavored so kids will eat them. The flavors are orange, berry, and cherry. Tablets come in fun animal shapes; tiger, lion, hippo, and elephant. The most nutritionally balanced children's multi-vitamin/mineral supplement available. Now with more antioxidant protection with added selenium, copper, and vitamins C & E.
Provides lots of calcium and all other nutrients necessary for strong, healthy bones. Promotes healthy immune function with vitamin C, zinc, and many more essential nutrients. Provides key vitamins and minerals important for young growing bodies.